We design and supply freestanding and shelving mezzanines to maximize your storage space. 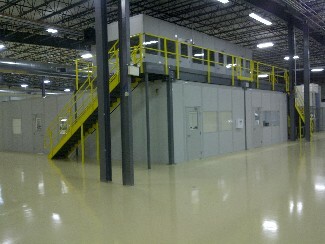 If you have a question about our mezzanine products please contact us for an appointment. Todays successful businesses squeeze the most from every square foot of available space they have, including the available vertical space. Ebtechs Modular Structural Mezzanines satisfy this directive by making existing space available for productive endeavors without a costly building addition. 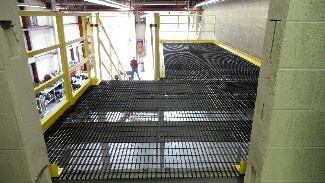 We design and manufacture our mezzanines here in the USA. The structural steel design is engineered for maximim strength, stability and safety. 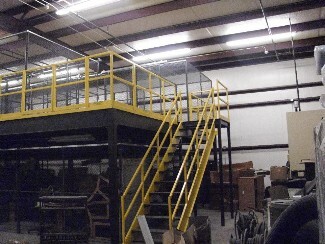 Unlike roll-formed mezzanines whose designs are not flexible in configureations or capacity, our mezzanines maintain their maximim capacity even when taken down and reconfigured. Our mezzanines do not have limitations as to the span size, allowing for more usable space underneath. Flexibility is what we strive for, which allows our systems to grow with the needs of your business. Our systems include a complete line of customizable components such as handrails, stairs, safety gates, security caging, guard rails, bollards, column protection and a wide choice of flooring materials. 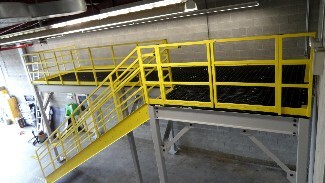 Our mezzanines are OSHA-, BOCA-, and IBC-compliant. Unique connection angle for column/beam assembly provides speedy assembly and a safe work area. The angles have beam connection holes to doubly secure the beam to column union. 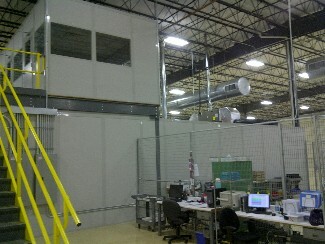 Structural Mezzanine with in plant office upstairs.